Founded in 1995, our MFA in Creative Writing combines a studio writing workshop component with an analytical component, offering courses in the craft of writing in poetry, fiction, and creative nonfiction. To date, more than 360 students have received degrees from the MFA in Creative Writing. Alumni have published over 60 books and have been published in numerous journals and periodicals, and they’ve won many distinguished literary prizes. Alumni have started internationally known presses and publications, including Omnidawn and the East Bay Review, and they have founded many important reading series in the Bay Area, such as Woolsey Heights, East Bay Poetry Summit, Literary Arts & Wine and the Studio One Reading Series. 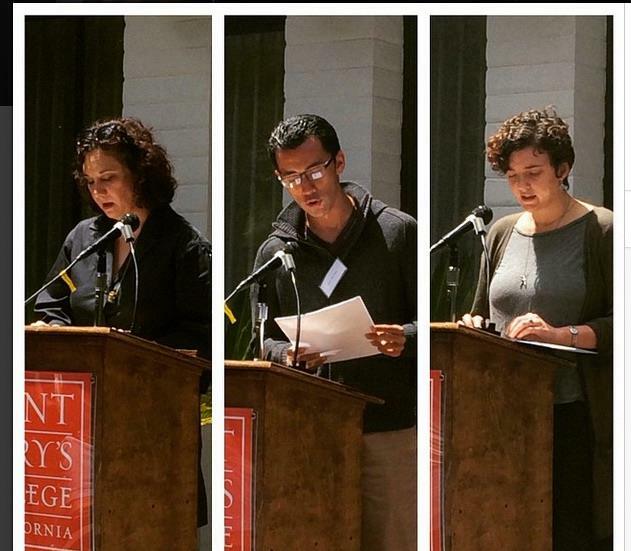 After 23 years the SMC MFA in Creative Writing continues to thrive, distinguishing itself by its award winning faculty and its opportunities for students in the areas of teaching, publishing, and community engagement. It remains a major part of the literary culture in the Bay Area and beyond. We welcome cohorts in creative nonfiction, fiction, and poetry to our beautiful mission style campus each fall. It's a setting that feels like a writing retreat with world class faculty with access to Oakland and San Francisco just short BART rides away. Priority deadline is December 10th (application fee waived) and final application deadline is January 31st. Creative Writing Professor Matthew Zapruder's article, "Everyday Failure," Appears in AWP Magazine. Lysley Tenorio receives the Rome Prize from the American Academy in Rome. "Spring 2015 M.F.A. Update: M.F.A. Programs to Watch," Publisher's Weekly. 13, March, 2015. We model inclusive community both in the classroom and in the larger arts community attending to the powerful role of our developing artists in the culture that is thirsty for the knowledge the arts can bring. Tuesday, May 7, 2019 - 8:15 P.M.
Wednesday, May 8, 2019 - 2:30 P.M.
Jason's latest poetry collection, Locus, is now available from Omnidawn!